Looking for that unique gift for the photo fanatic in your life? 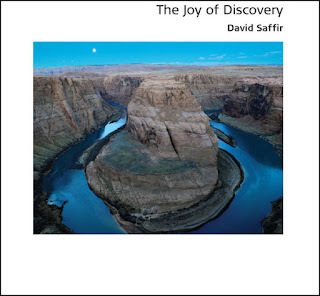 Then David Saffir's newest visual stunner -- "The Joy of Discovery" -- should be at the top of your list. This "celebration of my journey in photography" vividly illustrates David's keen eye for capturing the photographic art that's hidden within every location. Finding those image "treasures" may be well planned and require extreme measures, like being on location at 4 a.m. to catch a moonlit scene at a cliff's edge, or it may be the happy coincidence of timing. For any photographer who believes that travel to exotic locations is a fundamental requirement of successful photography, you need only browse David's images to realize that beauty is found everywhere. It's the exercising of imagination, craft and style that should be your focus. Some of David's images may look familiar, but they all have his special touch that make them uniquely Saffir images. His mastery of lines, tone and mood is evident in this book's broad range of subjects and is a delight to any viewer's eyes. Be sure to include David's "The Joy of Discovery" on your photo bookshelf. Visit his website to see several preview pages and for ordering details.